Howlin' Wolf Records: SIX STRINGS: MVD Entertainment Group: "MOHSEN MAKHMALBAF: THE POETIC TRILOGY"
MVD Entertainment Group: "MOHSEN MAKHMALBAF: THE POETIC TRILOGY"
One of the preeminent figures of Iranian cinema, Mohsen Makhmalbaf has written and directed an impressive array of acclaimed films, winning accolades at international film festivals and the admiration of world cinema audiences. 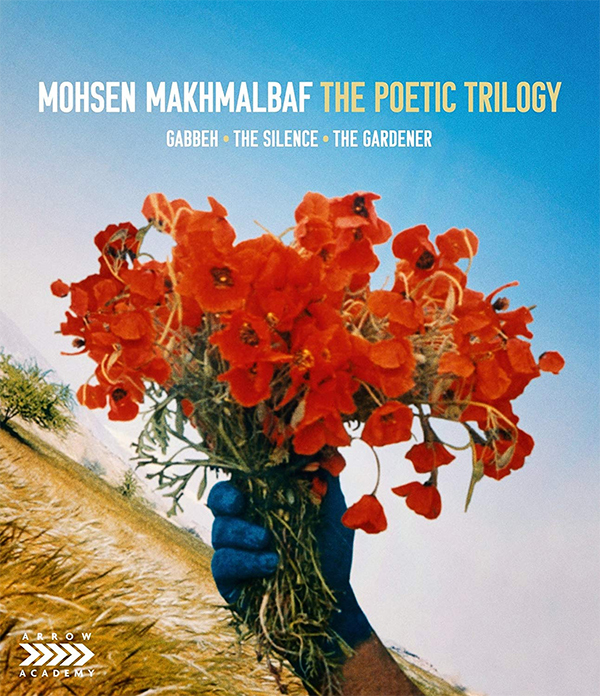 This collection presents three of Makhmalbaf's most lyrical films which the director has termed his Poetic Trilogy. Gabbeh tells of an elderly couple who stop by a stream to wash a vividly woven traditional Persian rug ('Gabbeh'). A beautiful woman, depicted in in the rug's elaborate design, suddenly appears and tells a heart-rending story of love and loss. A film imbued with the ideas of Sufism, The Silence tells of Khorshid, a young blind boy from Tajikistan who earns rent money for his family by tuning rare instruments but becomes enraptured by the sonorous music he hears on his way to work each day. The Gardener is an imaginative documentary which follows Makhmalbaf, and his son Maysam, to Israel to investigate the Bahá'í Faith, a religion with 7 million followers, which originated in Iran 170 years ago. As well as presenting a wealth of extras, this collection boasts stunning new restorations of Gabbeh and The Silence which truly bring the films' rich colours and imagery to life.